The scope of work includes the construction of a fast breeder reactor fuel processing plant. The plant will use plutonium produced in PHWR reactors as well as from PWR reactors to breed U-233 from thorium. (WNN) India’s Indira Ghandi Centre for Atomic Research (IGCAR) has awarded Hindustan Construction Company (HCC) a contract worth $120 million to construct a fast reactor fuel cycle facility at Kalpakkam. The scope of the work includes the construction of a fast breeder reactor fuel processing plant, plus associated civil, electrical and mechanical works. The project is to be completed in 48 months. The plant will use plutonium produced in PHWR reactors as well as from PWR reactors to breed U-233 from thorium. It is part of a massive three part nuclear energy strategy. A 500 MWe prototype fast breeder reactor (PFBR) at Kalpakkam in Tamil Nadu unit will start up in October of this year. Two more FBRs are planned for the Kalpakkam site. The fast reactor fuel cycle facility is the fourth construction contract awarded to HCC by IGCAR. The company is also executing contracts at an integrated nuclear recycle plant for the Bhabha Atomic Research Centre at Tarapur and for two PHWR reactors under construction at Rawatbhata. The second stage uses fast-neutron reactors fueled by plutonium to breed U-233 from thorium. This is the focus of the current project. In the third stage, the country will use advanced heavy-water reactors for power generation. They will be fueled with U-233 obtained from the irradiation of thorium in PHWRs and fast reactors. Fast breeder reactors are embodied in the second step to support India’s long-term goal of establishing a fuel cycle to exploit its abundant thorium resources, using the plutonium produced in pressurized heavy water and light water reactors and breeding fissile uranium-233 from thorium. India has the world’s largest known reserves of thorium. However, despite nearly three decades of being locked out of world markets for commercial nuclear fuel, the country made only modest progress on shifting to its use of thorium (fertile) with uranium (fissile) for use in nuclear reactors for electricity generation. Some of this can be chalked up to its commitment to using its uranium for development of nuclear weapons as deterrents against Pakistan, also a nuclear power, and India’s arch rival on the subcontinent. 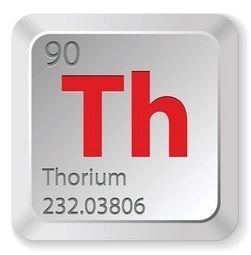 Thorium is more abundant in nature than uranium. It is fertile rather than fissile, and can only be used as a fuel in conjunction with a fissile material such as recycled plutonium. Thorium fuels can breed fissile uranium-233 to be used in various kinds of nuclear reactors. Molten salt reactors are well suited to thorium fuel, as normal fuel fabrication is avoided. The 300 MW Ft. St. Vrain nuclear reactor, located in Colorado used thorium / U-233 as a fuel from 1976-1989. It was a unique gas cooled reactor. It used thorium-HEU fuel in the form of microspheres of mixed thorium-uranium carbide coated with silicon oxide and pyrolytic carbon to retain fission products. These were embedded in graphite ‘compacts’ that were arranged in hexagonal columns (‘prisms’). Almost 25 tonnes of thorium was used in fuel for the reactor. The Ft. St. Vrain reactor was plagued by operational problems. According to the NRC 279 events were catalogued into seven general categories: (1) water incursion events or failures of moisture detection systems; (2) air or other unwanted gas incursion events and failures of gas detection systems; (3) fuel failures or anomalies; (4) failures or cracks in graphite, pipes, and other reactor structural components; (5) failures of nuclear instrumentation systems; (6) human factors and operator performance issues; and (7) other events or conditions that may be relevant to current GCR designs. Several events were reviewed over a period of years and appeared in more than one monthly report. Much of the ST. Vrain spent fuel is still located at the now closed nuclear reactor site which is about 40 miles north of Denver. Between 1980 and 1986, spent fuel from Fort St. Vrain was routinely shipped to the Idaho National Laboratory for temporary storage and testing. However, in October of 1991, political and tribal opposition in Idaho halted the shipments, followed by lawsuits in federal court. Idaho Governor Cecil Andrus led the effort to stop the shipments. An agreement in principle between DOE and Public Service Company was reached in 1995, and an out-of-court settlement was adopted in 1996. DOE took title to the spent fuel and became responsible for managing its temporary storage at the Fort St. Vrain site. The issue continues to haunt the Idaho lab even to this day. Commercial work by US nuclear scientists on fabrication and production of U-233 is documented in a US patent from 1983, which is assigned to Linton W. Lang and Robert L. Stetson. Linton Lang earned an MS in Chemical Engineering from the University of Idaho in 1954. He worked at DOE labs in Idaho Falls, ID, and in Richland, WA. Robert Stetson worked for most of his career at Lawrence Livermore lab in California. Both men have a string of patents for making U-233 for use in fast breeders. (WNN) Russia and India’s have announced plans to build units 5 and 6 at the Kudankulam nuclear power plant. The two countries signed a framework agreement enabling construction of this ‘third stage’ of the plant, including an intergovernmental credit protocol for implementation of the project. Financial terms of the deal were not immediately available but typically, Rosatom offers developing nations generous lines of credit along with a requirement that all fuel for the reactors over their 60 year lives be supplied by Rosatom and also spent fuel be returned to Russia. Indian firms will get some business such as turbines, but the major components, including the RPV for each reactor, will come from Russia. The documents were signed last June at the 18th Annual Russian-Indian Summit, held alongside the St Petersburg International Economic Forum, by Valery Limarenko, president ASE Group, and Sri Sharma, chairman and managing director of the NPCIL. Kudankulam, in Tamil Nadu, is home to two VVER-1000s. Unit 1 entered commercial operation in December 2014, while unit 2 reached 100% of its operating capacity in January this year. NPCIL signed an agreement on 3 April provisionally accepting Kudankulam 2 from its Russian suppliers and thus marking the unit’s entry into commercial operation. The unit reached first criticality in May 2016 and was connected to India’s power grid in August. Two further VVER-1000 units – Kudankulam 3 and 4 – are to be built at the site in a second construction phase. The first pouring of structural concrete for these units was marked in late June. This is the formal start of construction of a nuclear unit, although site preparation works have been underway at the Kudankulam site for several years. (WNN) Egypt and Russia have completed their talks on contracts to build a nuclear power plant at Daba’a. The two countries signed an intergovernmental agreement in November 2015 to collaborate in the construction and operation of a nuclear power plant equipped with four 1200 MWe units. Rosatom describes them as Generation III reactor technology that meets the most advanced security and safety standards. The agreement includes provision of a Russian state-backed loan of $25 billion for the $30 billion project. The Russian state loan will cover about 85% of the plant’s construction costs, with Egypt to raise the remainder from private investors. The project is to be completed within 12 years and Egypt will start its repayment of the loan at an interest rate of 3% from October 2029. Construction work at the plant – to be built near the city of El Alamein, which is about 3.5km off the Mediterranean coast – is expected to create 20,000 jobs. Once commissioned, the plant will employ around 4000 people. Contracts between Egypt and Russia will cover the construction of four power units, the supply of nuclear fuel for 60 years, the provision of services as well as waste and used fuel management. (NucNet) Areva has signed an agreement with Nuclear Fuel Industries – Japan’s sole producer of fuel for both boiling-water reactors and pressurized-water reactors – to provide 32 mixed-oxide (MOX) fuel assemblies for Kansai Electric Power Company’s Takahama-3 and -4 nuclear units in Fukui Prefecture, central Japan. Areva said the supply of MOX fuel assemblies is a follow-up to agreements signed with Japanese utilities from 1975 onwards for the reprocessing of up to 3,000 tonnes of spent fuel at La Hague in France. MOX fuel contains a mixture of uranium and plutonium oxides, providing a way to use plutonium separated during spent fuel reprocessing. All of Japan’s nuclear reactor units were shut down for safety checks following the March 2011 Fukushima-Daiichi accident. Of the 42 that remain operable, five have resumed commercial service. They are: Takahama-3, Takahama-4, Sendai-1, Sendai-2 and Ikata-3. Takahama-3 and -4 are both 830-MW PWRs that began commercial operation in 1985. (NucNet) If 10 nuclear power reactors are restarted in Japan by March 2019, the value of imported fossil fuels will fall by $4.55bn (€3.84bn), real GDP will increase by $4.55bn and CO2 emissions will fall by 2.7%, according to a report by the Institute of Energy Economics. Combined with the restart of several reactors and the increased use of renewable energies, energy-derived CO2 emissions will decline for the fifth consecutive year. They stood at 1,113 million tonnes in fiscal year 2017 and will be 1,096 million tonnes in fiscal year 2018, down 1.6%, said the Japan Atomic Industrial Forum (Jaif), quoting the report. According to the Agency for Natural Resources and Energy, replacing the electricity that would have been generated by still-suspended nuclear plants with increased oil-fired or gas-fired power resulted in an increase in fuel costs during fiscal year 2016 of some $11.8bn.